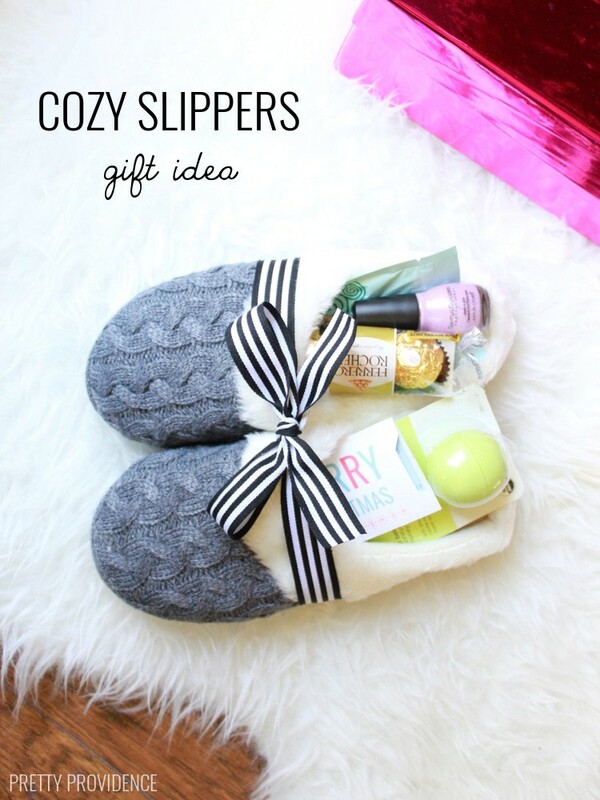 This easy slippers gift idea is perfect for any occasion! Here’s a cute video showing how to put the treats and gifts into your slippers and tie it all up with a bow. 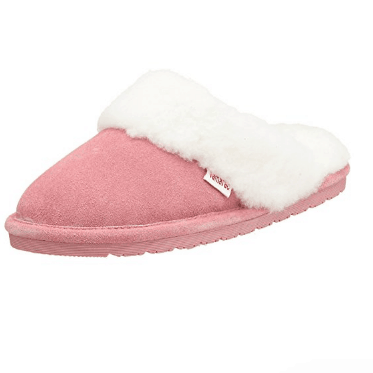 I found these cute slippers and my first thought was that I wanted to buy them for myself, but it’s Christmas! So I bought them for a family member and stuffed a few small gifts and treats into them, channeling St. Nicholas, and wrapped it all up with a bow. I love how when I go to Payless I am basically bombarded with great deals and a ton of options. There really is something for the whole family there. If you haven’t been lately I highly recommend stopping in there and giving it a go! Also, let me let you in on a secret, if you join their email list you will literally always have a coupon to use on top of the already low prices. 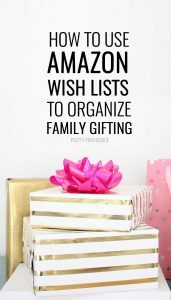 You can get gifts for all kinds of people on your list! 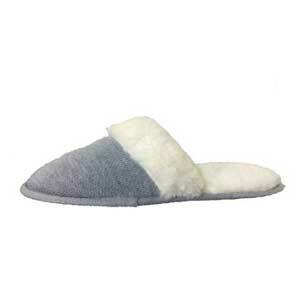 I think I am going to get some of these moccs for my brothers this year too, because my husband loves his. Since this gift is for a girl whose interests are similar to mine, I filled these with lip balm, nail polish, chocolate, a relaxing face mask and a gift card. 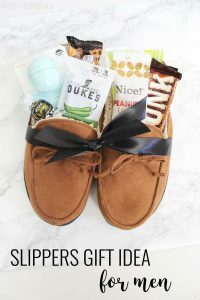 If I were to be filling guy slippers for my husband I’d probably put some new earbuds or some guitar picks in lieu of nail polish/face mask but the rest of the stuff could stay the same! 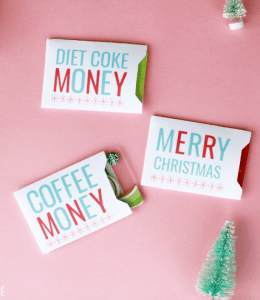 You can print the gift card sleeve I used for free at this link. I also did a guy’s version of this but with moccasin slippers! You can check that out here. Do you have any standing holiday gift traditions? I would love to hear about them! This post was originally published at prettyprovidence.com December 7, 2015 and was sponsored by Payless. Copyright 2015 all rights reserved. If you’d like to feature this idea, you may borrow ONE photo, not the pinterest collage, and link back to this post for the tutorial. Please do not include affiliate links to any of the items shown in your post. Thank you. Great idea for those family/friends you never know what to buy at the holidays! I’m taking a different twist and giving these to a Mom-to-be. New slippers for the hospital, some lip balm, hand lotion, hand sanitizer, chocolate and other munchies, AND and Starbucks giftcard for later! That’s an amazing idea! I am going to be having a baby this week, and I know I would totally love to get that!! 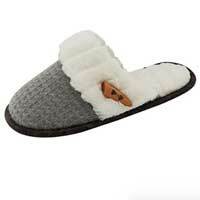 I looked up these slippers on Payless’ website and they’re $24.99 each. That’s a little high for me so I shopped around and found them at Bed Bath and Beyond for $9.99 each AND you can use a 20% coupon on each of them!! I’m going to fill mine up with some of the same items but I appreciate the idea! I can’t wait to give them to my bridesmaids! Oh that is so good to know!!! Thank you for sharing!! I’m sure they will LOVE them, and congrats on the UPCOMING marriage! Because of your picture that shows up in so many bloggers I am doing this. It will be a gift my son does for Christmas to his aunt. I have the slipper, the EOS and a printable I put it in. 4 nail polishes from Sallys. Need candy. However, what are the other things? I assume a gift card, but in the other side? I finally read it all and it is a facemask. Very nice. Yay! So glad you figured it out! Best of luck to you!